The Anglo–Mysore Wars were a series of wars fought in over the last three decades of the 18th century between the Kingdom of Mysore on the one hand, and the British East India Company (represented chiefly by the Madras Presidency), and Maratha Confederacy and the Nizam of Hyderabad on the other. Hyder Ali and his successor Tipu Sultan fought a war on four fronts with the British attacking from the west, south and east, while the Marathas and the Nizam's forces attacked from the north. The fourth war resulted in the overthrow of the house of Hyder Ali and Tipu (who was killed in the final war, in 1799), and the dismantlement of Mysore to the benefit of the East India Company, which won and took control of much of India. 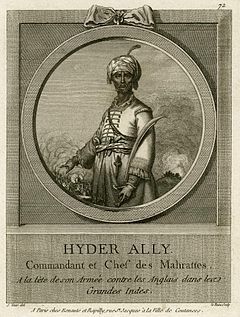 The First Anglo-Mysore War (1767–69) saw Hyder Ali gain some measure of success against the British, almost capturing Madras. The British convinced the Nizam of Hyderabad to attack Hyder, but the Nizam changed sides, supporting Hyder. That was temporary however, and the Nizam signed a new treaty with the British in Feb. 1768. Hyder did contend with a British Bombay army attacking on the west and a Madras army attacking from the northeast. However, Hyder's attack towards Madras resulted in the Madras government suing for peace, and the resultant Treaty of Madras. The Second Anglo-Mysore War (1780–84) witnessed bloodier battles with fortunes fluctuating between the contesting powers. Tipu defeated Baillie at the Battle of Pollilur in Sept. 1780, and Braithwaite at Kumbakonam in Feb. 1782, both of whom were taken prisoner to Seringapatam. This war saw the rise of Sir Eyre Coote, the British commander who defeated Hyder Ali at the Battle of Porto Novo and Arni. Tipu continued the war following his father's death. Finally, the war ended with the last British-Indian treaty with an Indian ruler on equal footing, the 11 March 1784 Treaty of Mangalore, which restored the status quo ante bellum. The Treaty of Gajendragad in April 1787 ended the conflict with the Marathas. In the Third Anglo-Mysore War (1790–92), Tipu Sultan, the ruler of Mysore and an ally of France, invaded the nearby state of Travancore in 1789 which was a British ally. British forces were commanded by Governor-General Cornwallis himself. The resultant war lasted three years and was a resounding defeat for Mysore. The war ended after the 1792 Siege of Seringapatam and the signing of the Treaty of Seringapatam, according to which Tipu had to surrender half of his kingdom to the British East India Company and its allies. The Fourth Anglo-Mysore War (1798–99) saw the death of Tipu Sultan and further reductions in Mysorean territory. Mysore's alliance with the French was seen as a threat to the East India Company and Mysore was attacked from all four sides. Tipu's army were outnumbered 4:1 in this war. Mysore had 35,000 soldiers, whereas the British commanded 60,000 troops. The Nizam of Hyderabad and the Marathas launched an invasion from the north. The British won a decisive victory at the Siege of Seringapatam (1799). Tipu was killed during the defence of the city. Much of the remaining Mysorean territory was annexed by the British, the Nizam and the Marathas. The remaining core, around Mysore and Seringapatam, was restored to the Indian prince belonging to the Wodeyar dynasty, whose forefathers had been the actual rulers before Hyder Ali became the de facto ruler. The Wodeyars ruled the remnant state of Mysore until 1947, when it joined the Union of India. After the Battles of Plassey (1757) and Buxar (1764), which established British dominion over East India, the Anglo-Mysore Wars (1766–1799), the Anglo–Maratha Wars (1775–1818), and finally the Anglo-Sikh Wars (1845–1849) consolidated the British claim over South Asia, resulting in the British Empire in India, though resistance among various groups such as the Afghans and the Burmese would last well into the 1880s. The Mysorean rockets used by Tipu Sultan during the Battle of Pollilur were much more advanced than any of the British East India Company had previously seen, chiefly because of the use of iron tubes for holding the propellant. This enabled higher thrust and a longer range for the missile (up to 2 kilometres (1.2 mi)). After Tipu Sultan's eventual defeat in the Fourth Anglo-Mysore War and the capture of a number of Mysorean iron rockets, they were influential in British rocket development, inspiring the Congreve rocket, which was soon put into use in the Napoleonic Wars. The First and the Second Anglo-Mysore War. ^ a b c d e Naravane, M.S. (2014). Battles of the Honorourable East India Company. A.P.H. Publishing Corporation. pp. 172–181. ISBN 9788131300343. ^ Roddam Narasimha (1985). Rockets in Mysore and Britain, 1750–1850 A.D. Archived 3 March 2012 at the Wayback Machine National Aeronautical Laboratory and Indian Institute of Science. Cooper, Randolf GS. "Culture, Combat, and Colonialism in Eighteenth-and Nineteenth-Century India." International History Review (2005) 27#3 pp: 534-549. Jaim, HM Iftekhar, and Jasmine Jaim. "The Decisive Nature of the Indian War Rocket in the Anglo-Mysore Wars of the Eighteenth Century." Arms & Armour (2011) 8#2 pp: 131-138.